Leg 1 - A vacation to Hawaii provided by American Airlines Vacations. Leg 9 - A vacation to Cancún provided by American Airlines Vacations. Leg 10 - A vacation to Puerto Rico provided by American Airlines Vacations. Leg 11 - A vacation to Los Cabos provided by American Airlines Vacations. Leg 12 - A vacation to London and Paris provided by American Airlines Vacations. Due to a production error, which caused a delay of 1 minute, this prize was awarded to the 1st and 2nd place teams of this leg. The Detour on this leg was Mountain or Beach. In Mountain, teams walked into a short distance and rappelled 590 ฟุต (180 เมตร) down into Sugarloaf Mountain. When they were done, the climbing instructor would get their next clue. In Beach, teams must take a gondola to the ground and proceed to Ipanema Beach to find the woman who inspired the song "The Girl from Ipanema" on the beach using only a photo. If the woman is found, she would give them their next clue. On Paqueta Island, teams had to find a big tree known as "Fat Maria" and follow the local custom to kiss the tree. Also on Paqueta Island, teams had to sign-up of one of three boats leaving the next morning. Iguaçu Falls, the site of this leg's Roadblock. In this Fast Forward, one team member had to play volleyball with a score of 10 points and play against locals who could only use their feet. Once completed, the team would won the Fast Forward. The Detour on this leg was Freak Out or Seek Out. In Freak out, teams had take to hang glide from a mountain to the beach below with a local instructor. When they landed on a beach, they would get their next clue. In Seek Out, teams had to find metal detectors to look for the next clue. The Roadblock was one team member to take a map and speedboat into Iguaçu falls over the rapids and spot the flag at the top and follow the marked path to lead the way for the clue. At the start of the leg, teams had to match the feather to one of the dancers' headdresses. When they find her, she may provided them to get their next clue. Robben Island, where teams found their clue inside Nelson Mandela's former prison cell. The Detour on this leg was Dance or Deliver. In Dance, teams wear an orange costume and they had to sang and danced with a local troupe until they made R 25 in tips. The troupe leader would take the money and get their next clue. In Deliver, teams had to carry fish from the boat and delivered it onto these scales. Once they weighed in 125 กก. (280 ปอนด์), the fish monger would get their next clue. The Roadblock was one team member to buy a box of Epsom salts and Smiley (sheep's head), then deliver them as an offering to a healer called Ndaba Sangoma who will then give them a bitter potion, to drink. In return, they will use them to prepare liquid remedy and both team members must drink all of them to get their next clue. At Robben Island, teams must find Section B Cell 5, which is Nelson Mandela's prison cell, to get their next clue. 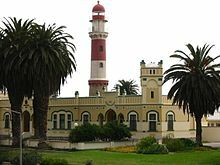 Swakopmund Lighthouse where teams to find 4x4 vehicles on a nearby lot where the clue is situated. In this Fast Forward, teams had to search the hotel grounds and find the pool to retrieve the Fast Forward Award from inside. The Detour on this leg was Slide or Stride. In Slide, teams had to slide down at the steep side of the dune and directly find the route marker on the bottom. In Stride, teams must follow the flags and had to walked down the other side of the dune. The Roadblock, was one team member to use bargaining skills and had to buy one of five wood animal carvings (lion, rhino, buffalo, leopard and elephant). To complete this task, they have to bring all woodcarvings to the bushmen to added a giant giraffe which the clue is located. They had to bring the giant giraffe to the pit stop. At Cape Aviation Business Centre located on a said airport above, teams take one of two charter flights with a scheduled times of 9:00 am and 12:00 pm. At Swakopmund Lighthose, teams are find a 4x4 vehicles on a nearby lot, once they spot them, they can run a lot and pick a truck where the next clue located on the truck. They are accompany by a local driver for a safety reasons. Upon arriving on Spitzkoppe, teams find the store and they need to go inside then find a postcard for the next clue. The Detour on this leg was Confusion Now or Confusion Later. In Confusion Now, teams needed to find a specific water taxi dock then take one to a bird market and release a cage full of sparrows. In Confusion Later, teams had to take a taxi to Chinatown in Charoen Krung Soi 21, they have to purchase a car, which it made from paper and then they burn it at Lee Ti Biew shrine. For this Roadblock, one team member had to wear a mask into a cave full of bats and they retrieve their next clue from inside. The unused Fast Forward had teams find Pra Chai at Amulet Market and one team member had to shed their vanity and get their head shaved. The Detour of this leg was Boat or Beast. In Boat, teams must travel and used bamboo raft with long poles to navigate down river. In Beast, teams had to ride on a back slow elephant down a path next to the river. The Roadblock was one team member to wash chalk markings off an elephants where decorations used in religious ceremonies back until the judge was satisfied and they would get their next clue. The Fast Forward was one team member to search the basement of the Wong Tai Sin Temple. Once there, they have to search a woman named Amelia Chow and had give each a face reading and palm reading. If its successful, they would win the Fast Forward and straight ahead to the Pit Stop. The Detour on this leg was Wishing Tree or Herbal Tea. In Wishing tree, teams had to drive 18 ไมล์ to this tree. Once they get there, they need to write a wish on a scroll and throw it on the tree's branches. In Herbal tea, teams had to walked to a herbal shop on a marketplace in Saigon Street. Once there, they had to drink a cup of foul tasting tea. The Roadblock was one team member to climb the top of the crane and use this controls to move 2000 ปอนด์ shipping container off a truck to the ground. When its done and it moves back to its original position, a team partner may get the next clue on the side of the shipping container. At Central Plaza, teams use binoculars are provided and search the find green and white colors of the Star Ferry terminal. Still in Hong Kong, teams arrived at Murray House for the location of the Detour clue. The Fast forward was one team member to find Po Lin Monastery and they had to climb 268 steps of the Tian Tan Buddha and find the clue. Tara & Wil decided to took the Fast Forward, they changed their plans and declined to used it. The Detour on this leg was Dragon or Lion. In Dragon, teams had to row a dragon boat made for twelve through a short marked course, a distance of 600 meters. In Lion, teams had to carry a two person ceremonial lion through a long crowded market and up stairs. The Roadblock required one team member to follow a series of clues written in Australian slang (Team members had to find the surfie in the lairy daks in Martin Place, the anklebiter riding a bicycle around the Archibald Fountain at Hyde Park, the Sheila in the Aussie cozzie near Captain Cook Statue in Hyde Park and the bushie in Circular Quay) to translate them to complete in each order of the task until this is not over and told them to return on their team partner. Teams visited the Sydney Harbour Bridge in leg 9. The Fast Forward was one team member to go to Harry's Cafe. Once there, one team member to eat one of their Australian meat pies. The Detour on this leg was Cool Down or Heat Up. In Cool Down teams had to find a particular Coober Pedy mine called the Opal Quest then search through a pile of dirt for a opal. Then, they must bring it back to the miner on a blue truck. If the found the real opal, the miner will get their next clue. In Heat Up teams played three holes of golf on a hot desert golf course called Cooper Pedy Golf Club. They are given a map that help to find a ball and playing as high of 130 degrees. The Roadblock was one team member to play a game using a traditional hunting tool known as boomerang. A player stand inside a circle then throw it from the outside and have it return or landing inside a circle. They would pick as many throws, if they show up and they will take turns to throw it. At the Sydney Harbour Bridge, teams may accompany a sign-up for Sydney BridgeClimb and they would get their next clue. Upon arriving in Adelaide, teams may sign-up one of three charter flights to Coober Pedy. In the Quick Jump detour choice, teams had to bungee jump 450 feet off the Nevis Highwire Platform. The Fast Forward was to take a speedboat down the narrow Shotover river and find a flag to win the Fast Forward. The Detour on this leg was Quick Jump or Long Hike. 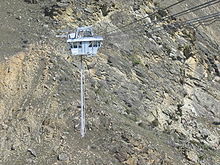 In Quick Jump, teams had take a bungee jump 450 ฟุต (140 เมตร) down to find the clue at the bottom of the canyon. In Long Hike, teams had to hike down a long trail to the bottom of the canyon. The Roadblock was one team member to find a sheep and separate 3 black sheep from 22 white sheep from a small pen to another. When its done, both teams are head straight to check the pit stop. In Glendambo, teams must get on either a 10.30am or 11.15am flight to the nearest airport, in Adelaide. The Fast Forward had to run down Mount Tarawera's loose rock walls and then had to hike the path and complete the run on a loose volcanic rock known as scree and on the mouth of the dormant volcano where had to find the clue box below. The Detour on this leg was Drop or Climb. In Drop, teams and their guide had to descend 350 ฟุต (110 เมตร) into the free rappel cavern known as The Lost World and the clue is located on an igneous rock. In Climb, teams had to climb down a 100 ฟุต (30 เมตร) ladder into the cavern and walk it to find the clue. The Roadblock was one team member to ride an ATV and navigate through a challenging off-road course in a difficult terrain and they need to pick up a clue on the beach. In leg 12, teams are fly to Maui, Hawaii. The Detour on this leg was Bike or Walk. In Bike, teams had to ride a bicycles and search through a large pineapple field to find a single red painted pineapple. In Walk, teams may walk on foot through the same field to find one of 4 yellow painted pineapple. In either case, once the teams found a right pineapple, they are to open it up and get their next clue. In both detours, they have to search colored pineapples hidden somewhere on this large field. The Roadblock was one team member to wear snorkel gear and to find one of three yellow cases in an underwater and retrieve a clue sealed inside. 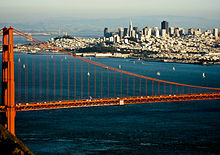 San Francisco was the race's final destination city. The Roadblock was one team member to use any tools picked up from a hardware store (see additional tasks) and to get a frozen clue in a large globe of ice out. At Trapper Creek, teams had to spend the night in an igloo to receive their next clue. Also at Trapper Creek, one team member must drive a Snow Cat across a frozen lake. At Homesteader's Hardware Store, teams had to pick up some tools and get the next clue. After picking up the tools, teams may pick up a bag of tools and propane torch to provide and reach the next destination. หน้านี้แก้ไขล่าสุดเมื่อวันที่ 28 ธันวาคม 2561 เวลา 18:29 น.